Peanut butter & jelly makes me feel like a kid. 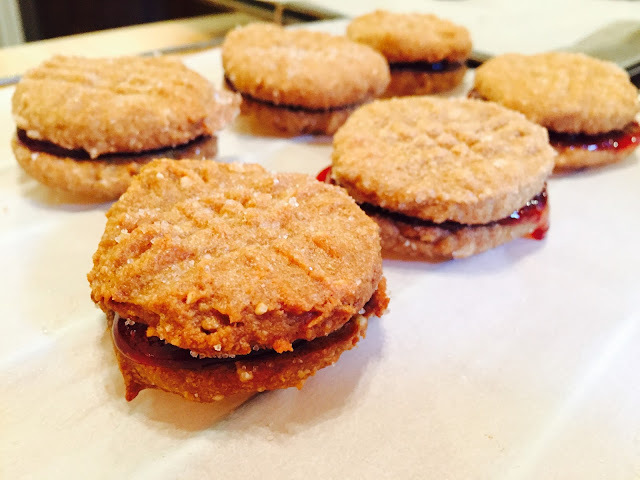 Why not make PB&J sandwich cookies? They’re easy to make, transport, and eat. The simplicity of these peanut butter cookies are what make them so irresistible. This recipe I made extra peanut-buttery by adding in processed roasted peanuts rather than any type of flour. I also minimized the sugar in the recipe, just to add the necessary sweetness for the cookie. Using a food processor (I use a mini-prep size), add in the white + brown sugars + roasted peanuts. Process until finely ground and homogeneous. In a medium/large bowl, using a fork, scramble the 1 whole egg and 1 egg white. Add in the sugar + peanut/sugar mixture and blend with fork until uniform. Add in peanut butter in three portions and mix by hand until just mixed evenly. Warning – do not over mix or the oil will start separating out. If the batter is too soupy, let sit for several minutes to thicken. Put 1/2 cup granulated white sugar in a small bowl. Using a small scooper or two teaspoons, portion out each cookie. Roll the dough in a ball and coat in sugar, or put the scoop of batter into a small bowl of the sugar and roll around until coated. Put onto parchment paper on a cookie sheet or cooking stone and cross-mark with a fork (12 cookies/sheet). Bake for 10-12 minutes, until lightly brown on edges. Sprinkle with a little more sugar fresh out of the oven for a more sugar-frosted effect. Cool on rack. Take about a half cup of the jam/jelly/preserves and microwave for about 20 seconds. Remove and stir. Add in more of the jam to cool off and stir. This makes it easier to work with and the jam will set up once cooled as a sandwich cookie. Time for assembly: turn over half of the cookies and add in the warm jam, about a heaping teaspoon; allow to cool for a minute or two. Place the other cookie on top and allow to sit for at least 30 minutes to set up. Easy to pack up in plastic wrap for packable lunches. They freeze and thaw out well, too. This is part of Food Network's Fall Fest. Check out The FN Dish. The fall theme we're focusing on here is anything for the kids. On twitter, we're tagging #FallFest.